For as long as there have been people putting boats to sea, there have probably been pirates close behind. 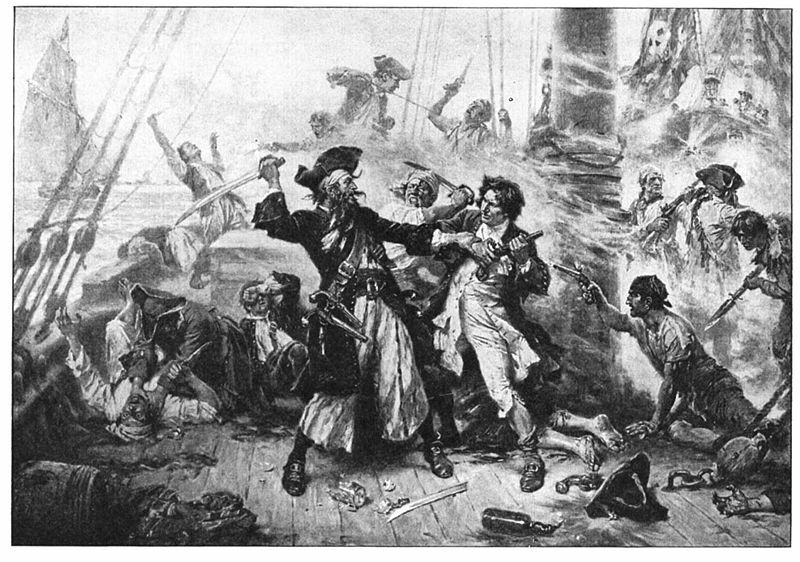 Even though the classic high period of piracy perhaps only spanned a few decades in the 1600 through 1700s, pirates have loomed large in popular culture from Robert Louis Stevenson’s Treasure Island all the way through to the Johnny Depp-fuelled blockbuster Pirates of the Caribbean film franchise. Piracy will also be the theme of the latest release in the Assassin’s Creed video game series next month, and the game is already being lauded as a potential game of the year for its historical high seas combat. Naturally, pirates find their way to gaming tables. I like checking in on the UK-based blog Shed Wars for a fellow gamer’s incredibly elaborate pirate miniatures gaming. While I’m rather certain pirate miniatures gaming is never going to be my thing, I have played my share of pirate games over the past thirty years. In the early 1980s, Milton Bradley launched their Gamemaster Series. While Axis and Allies would be the one game to catch on, the series also included other historically-themed wargames packed full of some nifty design, tons of plastic miniatures and varying levels of gameplay. The two player Broadsides & Boarding Parties featured a card-based maneuvering “broadsides” combat phase of the game which then led to a close-quarters “boarding parties” series of turns. During hand-to-hand attacks, each player moved their pirate, canon and captain figures among the two large ship models in an attempt to capture the opposing captain. 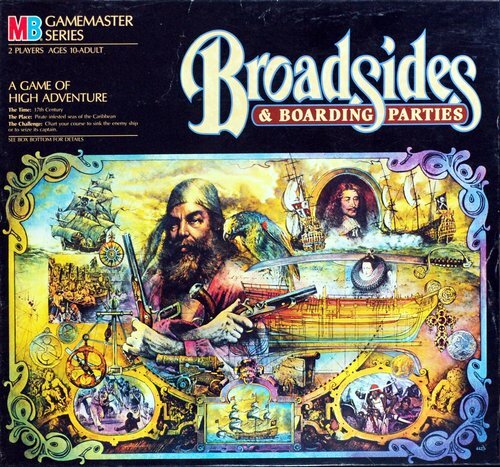 Like many of the games in the series, Broadsides & Boarding Parties was a great looking game, but the play was a bit simplistic and it wound up collecting dust on my game shelf. Just over 20 years later, WizKids introduced the Pirates of the Spanish Main constructable miniatures game. This still-popular game consists of collectible packs of ships in plastic credit card-sized punch-out packs. 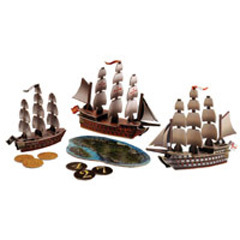 Each pack contains a whole game with a couple ships, rules, islands and playing tokens. The system went through a number of expansions with additional ships from varying eras and nations along with special island island fortesses and even sea monsters. Along with the movie series, a Pirates of the Caribbean series was also released with the ships, characters and story pulled right from the films. The ships looked fantastic although proved to be a bit brittle during gameplay which involved trade, combat and double-crossing across an open tabletop board. Although the game was officially shuttered in 2008, a huge secondary market continues for unopened packs of game cards. When my two sons were younger, we played the heck out of the 1992 card game Loot. This surprisingly engaging and award-winning kid’s game by Gamewright allows for play as a merchant or pirate. Pirate cards come in four colored “suits” with a captain card for each suit. Each pirate card carries an attack value denoted by a number of skull symbols. Pirates compete to attack merchant ships carrying different gold values, and an Admiral card shows up to protect merchant ship. Each player manages their hand through a series of draws, plays and discards as gold is collected and attacks by other pirates are thwarted. While the original Loot features cartoonish graphics, an updated more historically-themed version was introduced in 2010 under the name Korsar. 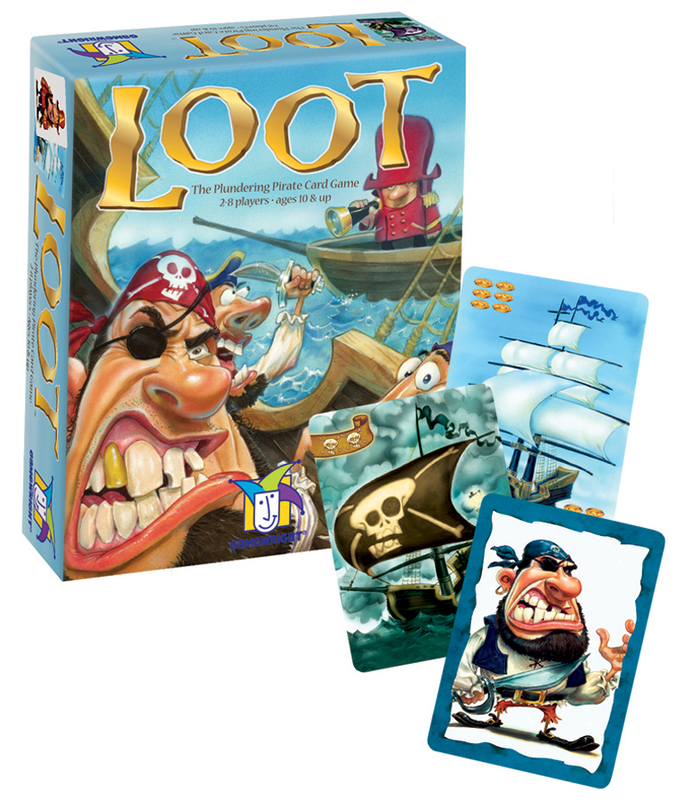 Whichever version you get your hands on, Loot is a pretty simple but engaging card game for crews of all ages. This past weekend at Metropolitan Wargamers in Brookln, NY, I had the chance to get my sea legs with two more pirate games: Cartagena and Merchants & Marauders. 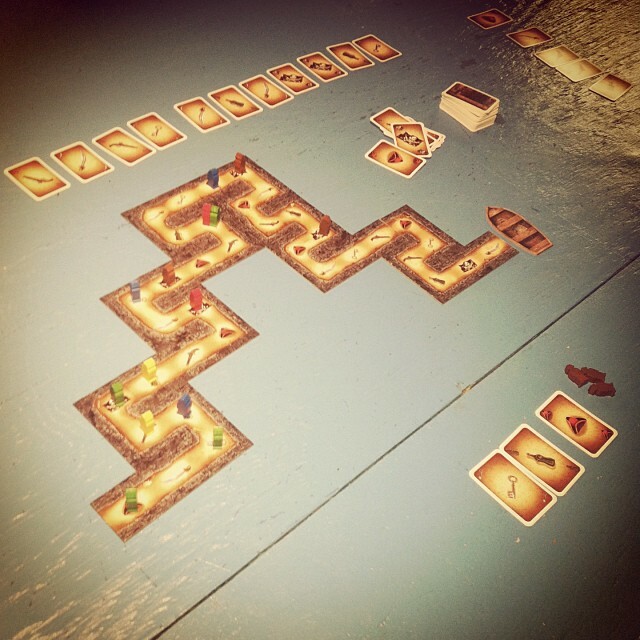 Cartagena is a quick game recreating the late-17th-century pirate jailbreak in Cartagena, Colombia. This wordless, diceless, easy-to-play game sets each player with five pirates making their way along a dock game board toward an awaiting getaway boat. Each player begins with six cards featuring hats, bottles, swords, keys, pistols and Jolly Roger flags. Playing a card allows a player to move one of their pirates along the board to the next empty space featuring that symbol. Players may double and triple-up placement on a space, and additional cards may be drawn from a face-up row of cards by moving backwards along the dock. Moving back to a space with one other purate gains a player one card, while moving back to a space with two pirates gets a maximum two-card draw. Players move forward and backward, acquiring cards and playing them as they progress toward the boat. Strategy comes in planning out your card moves with available spaces on the board, blocking other pirates and stealing in-demand cards from the draw row. 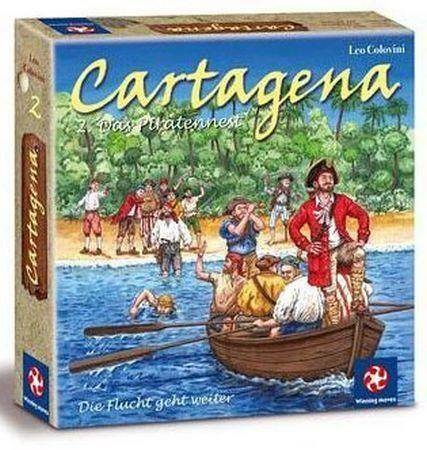 The simplicity of Cartagena makes this a great choice for little pirates in your life while it also holds interest for some aggressive adult play like my first game this past weekend with some club members. 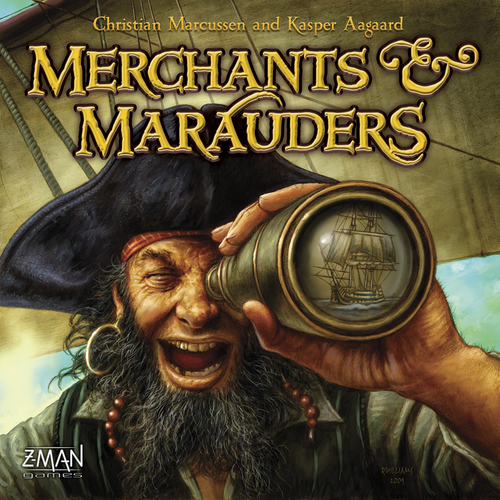 Merchants & Marauders from ZMan Games is a beefier boardgame akin to the Viking exploration and conquest game Fire & Axe. Set among the islands and seazones of the Caribbean, the game allows players to play as merchant traders or dastardly pirate captains set on acquring gold, completing missions, following rumors and scoring points toward victory. Players begin with their ships at a home port island with each port offering varying bonuses to different types of players. In each turn, players may take three actions of movement, scouting or port activities. While in port, captains may trade or sell goods, repair damaged vessels, acquire special crew and outfit or upgrade their ships with additional weapons and equipment. Each port shows goods that are in demand like tobacco, rum or spices, and trading in-demand goods scores extra victory points and special Glory cards that can add to a players effectiveness in particular situations. Pirates acquire goods agressively at sea but risk becoming wanted by the various nations looking to go to war with seafaring criminals. There’s a lot of flexibility in the heading to victory a captain charts. Players may focus on trading or seizing goods, completing missions to other ports and attempting to chase down legendary rumors amid the islands. Attacking other ships can gain goods and gold but players run the risk of damaged or sunken ships that can set them back a few turns. Event cards at the top of each round inject additional elements to the game with storms and other sea-bound pitfalls reducing speed or even wrecking ships. 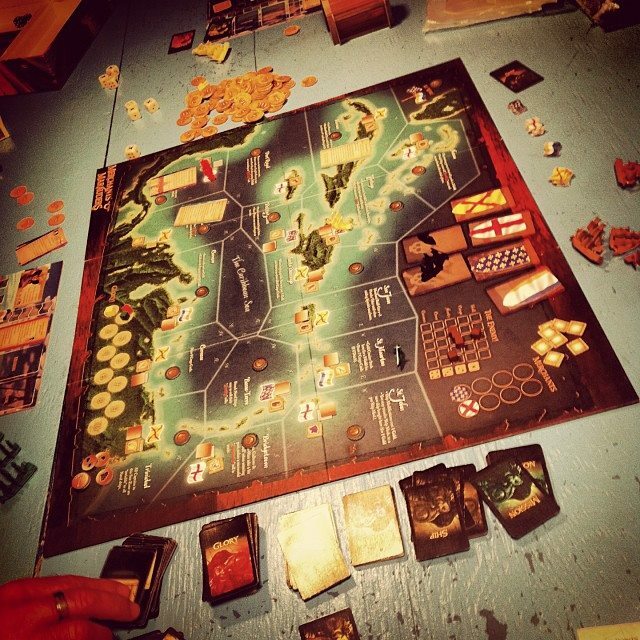 Games of Merchants & Marauders typically run a couple of hours, and players must balance their own captain’s focus with what are other players are doing. Like the legends of piracy, there’s a lot of variety to be found in pirate gaming. Aside from the games I’ve played and the many miniatures systems available, their are dozens of other pirate-themed games to suit an level of interest. The storied history and mythology of pirates yields a bounty of treasure for any gamer looking to raise a crew under the Jolly Roger and set out in quest of adventure, booty and intrigue on the Seven Seas. Collector’s Note: Broadsides & Boarding Parties is available on eBay and elsewhere starting at around $50, Pirates of the Spanish Main is set to re-launch soon, but older expansion packs are likewise available via eBay in the $5-10 range and even cases of some card sets are available. Scalawags and bucaneers will find plenty of fellow pirate card, boargame and miniature action at most major gaming conventions. Arrrrrgh!